Lions with their partners, enjoyed a Christmas Dinner at the Farrington Golf Club. President John presented Lion Tony Hill with his 25 year club service award and spoke highly of Tony's work for the benefit of Lions and the Community. We have completed our collection, and thanks to you, have raised over £2000 for our charity funds. Super Market Dash, Nov 2004. Safeway/Morrisons Superstore was again the venue for this annual event chosen by your local Lions club to win Christmas Goodies. With the help of a runner, Mr Holden took home £230 of groceries, Dawn Heal and Ruth Tustin each received a £25 voucher. Margaret Leggatt received the bonus prize of a Memory Craft 300E Janome sewing machine. The dash, supervised by event organisor, Lion Dave Ingram, created the usual cheers and congratuolations from Lion President John Whittock who also presented the other prizes. Thanks are extended to the Store Manager, Darren Dredge and his Deputy Manager, Amanda Pike, for making the draw and their help in organising the dash, and to the anonymous donor of the sewing machine. Thanks are also extended to all those who supported this Lions cause, with proceeds being donated to Lions charities. Where the Lions fund (your donations) have gone. Raising money for all sorts of causes, local and international, is part of the aims of your local Lions club click here for where that money has gone. To help those in need requires hard work and dedication by those who feel passionate about others. This is part of what being a Lion is all about. Would you like to be a Lion? contact us. SPECTACLES: which, after cleaning and calibration, will go to the third world. COINS: which benefit the Bosnia Area. STAMPS and OLD MOBILE PHONES: which help Water Aid. 1 & 2 October 2004: Club collected £945 at Tesco for charity funds. 25 September 2004: Dental equipment delivered as part of the Dentaid project (click here for more information) to supply surplus dental equipment to developing countries. 7 September 2004: Presentation of defibrillator made to Camely Surgery. 5 September 2004: Monthly quizzes re-start at High Littleton United Services club. These are held on the first Sunday of every month. 28 August 2004: High Littleton and Hallatrow Fete. 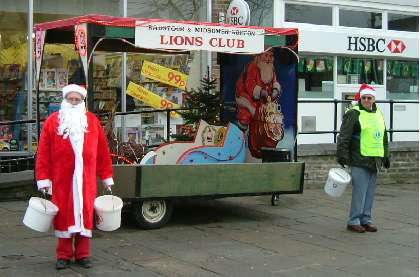 The club were in attendance with the Teddy and Lion stall. 25 June 2004: Handover night. All change at the club, as the presidents batton is handed over. 21 June 2004: Lions help Josh. Three year old Josh suffers from Cerebral Palsy and Hydrocephalus and requires a specifically designed skwirrel electric wheelchair to meet his needs. Born 9 weeks early, he suffered a brain hemorrhage, which led to his present condition. The chair should meet his needs for the next ten years where upon it will need modifications. The club assisted with the final payment of £1,265.00 to enable the order and purchase of the wheelchair to be made. 7 June 2004. Lions Charity Golf Day. Under a blazing sun, 68 players from 18 clubs as far afield as Cheltenham and South Wales, competed in a 4-ball B/B competition in aid of Greenhill House Cheshire Home, Timsbury. Just over £1,300.00 was raised for the home. Thanks are extended to the management of the Farrington Golf Club for donation the course, without this support the event could not have taken place. Special thanks go to Lion Geoff Moore, who organised the event, and to Berkley Coaches, Paulton and BWG Cleaners, who sponsored the matches and putting competition. Thanks are also extended to those who donated draw prizes. The overall winners were Steve Cook and John Butler who had 51 stableford points, with local knowledge winning the day. Second were G. Tripp and J. Trouncer from Clevedon with 46 points, and third were A. Jones and R. Megcoth of Chipping Sodbury. Tuesday 4th June: At the business meeting, we presented Mrs Caroline Edgell with a cheque for £100 following her completion of the London Marathon on behalf of the National Multiple Sclerosis Society. To improver her fitness she started running last October and her preparation included completing 3 half marathons. Caroline raised a total of nearly £3000. 24th May 2004: Cystic Fibrosis. At the business meeting on 5th May, Allan Williams, News Editor of the Somerset Guardian. Allan gave us an insight of the work of the Cystic Fibrosis Trust. Despite being a sufferer himself, Allan ran in this year's London Marathon, receiving sponsorship of £6000.00, including the proceeds of £800.00 donated by Lions from the recent concert given by the Bath Light Operatic Group. Allan thanked the Lions for their efforts and wished the club every success in its future events. 24th May 2004: Unexpected Gift to Lions. Paultonians, Bryan Pulsford and Lion Jack Church visited Bournemouth on a business trip in April 2003. Walking down the Pier Approach, and on top of a litterbin, they found a girl's bag complete with a small teddy, photographs and a purse containing £50.07, including a Scottish £20.00 note. Their hotel, the local Lions Club and newspaper Bournemouth Echo mad exhaustive inquiries without success. Twelve months later, the local police contacted them, returning the bag and its contents. Donating the money to the Tom Huyton Play Park Appeal Fund was their response as this would help disabled children. Lion President Robert, thanked them for their generosity and thoughtfulness. 17th May 2004: Unwanted Items. The club is appealing for spectacles, mobile phones, stamps and coins which can be put to good use through our various outlets. Coins will got to an appeal to aid Bosnia and Lion Alan Denham is collecting these and can be contacted on 01761 470276. Stamps will help Water Aid and spectacles will go to the Third World. Lion Ray Brimble is organising the collection of these items and can be contacted on 01761 412614. Mobile phones will also benefit Water Aid and Lion Church will collect these. He can be contacted on 01761 414393. Collection of items can be arranged, your phone call will start the process. This is a painless way of helping those less fortunate than ourselves. 10th May 2004: Lions Easter Eggs. Raffling Easter Eggs and raising charity funds has been one of the many events organised by the club. Starting with just 12 eggs, 4 years ago, this year the club placed 53 eggs in local pubs, clubs, works canteens and residential homes. This event, organised by Lion Alan Denham, has raised £1145. Thanks are extended to all those who purchased raffle numbers for the large eggs and to those who won, we hope you enjoyed the chocolate. 10th May 2004: Quiz Nights. Since last September, the High Littleton branch of the Royal British Legion has hosted the Club's quiz nights, raising money for the Tom Huyton Play Park Appeal. Raising nearly £1000, chairman Harold Hill's valued contribution to the appeal has been appreciated by Lions with his hard work and dedication to this worthy cause. Last Sunday, he was presented by Lion President Robert Briggs with a framed certificate and thanked for his sterling approach. Thanks were also give to Lions Quiz Master, Richard Munden, Scrutinear, Alan Denham and marker Barry Rogers for their commitment to these successful quiz nights. The Lions would like to thank the Legions teams and members who took part, without whom, this money would not have been raised. 26th April 2004: Bath Light Opera Group (BLOG) concert last Thursday was a great success for the club. Nearly a sell out, the audience clearly enjoyed the performance of musical comedy and classics. Matthew Finch, Musical Director and David Tucker, Director, led the group with its wealth of talent providing an evening of great entertainment. Featuring Hey Big Spenders, Screen to Stage, Career Girls and Evita with Come Away with Us, Heartfelt, Return to the Forbidden Planet, Blue Period and finally, Jesus Christ Superstar. All together a superb evening to be proud of by your local Lions Club. President Robert Briggs thanked the group and soloists and Lions Activities Committee for their efforts, the Church ladies for the refreshments, and St. John Ambulance for their attendance. Special thanks to Leslie Wilkins for playing on the new Makin organ which will have its Inaugural Recital on the 15th May, given by Mr. Phil Davey of Truro Methodist Church. The proceeds will be given to the Cystic Fibrosis Trust . Vera, wife of Lion Bob Adams, spoke on her personal experience with the problem of Cystic Fibrosis. Thank you Vera. Tuesday 6th April: At the business meeting, we were pleased to welcome Leslie Fox. Click here for more information. 4th April 2004: The Annual Charter Dinner was held at the Centruion Hotel, Midsomer Norton. Click here for more information. 4th April 2004: Lions Easter Eggs. Raffling Easter eggs for several years and raising charity funds has been on of the regular events organised by the Club. Starting several years ago with 12 eggs, this year we placed 53 eggs in pubs, clubs works canteens and residential homes. Organised by Lion Alan Denham, the original income was not great, but multiplied by 53 well over £1000.00 will be raised. These charity funds are not for any particular use, but we do try to support local appeals which also includes the Chew Valley area, where in the past, a Lions Club was in existence. Last year we used some of the funds to start the Tom Huyton appeal, and it may be necessary again this year to round off the appeal fund. So far as we are aware, the equipment purchased will be installed within the next few months. GOOD NEWS INDEED! Whilst the Lions of your local club launched the appeal, it is the public at large, together with others, who have actually raised the £12,500.00 required. We thank you for making this appeal a success. Thursday 1st April: Robert Brigs, the club president, was arrested, and later released on bail. Don't panic, this was a fundraising event for the RUH, Bath. Click here for more information. Saturday 20th March 2004: At the annual convention hosted by the Dursley club, our secretary was recommended for the post of District Governor, for 2004-2005. This does mean that we will be losing his services very shortly, and the club is now looking for someone to take up the challenge. We wish Alan a successful year, and thank him for his work over the past few years. We also look forward to him addressing the club in the capacity of District Governor. Tuesday 16th March 2004: The club was addressed by Mr Mike Peacey, from Wessex Water, who gave a very interesting talk on Water Aid. Tuesday 2nd March 2004: At the business meeting, we were pleased to welcome two new members to the lions. Click here for more information.